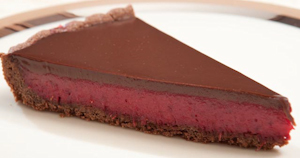 Place the cranberries in a rimmed baking pan and pick over to remove any that are blemished. 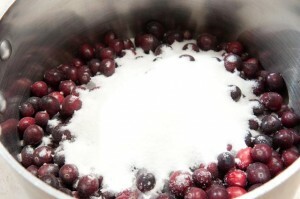 Cook the cranberries with sugar and water. 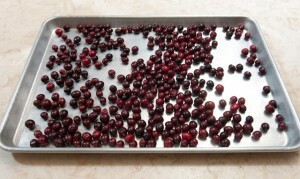 Cook over low heat until the cranberries are very soft. 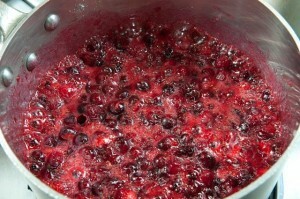 Stir frequently until the sugar melts and the berries start juicing. Bring to a boil, stirring frequently. 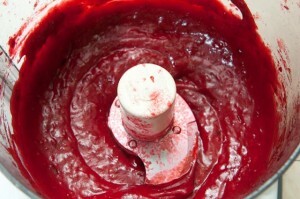 Immediately puree in food processor (by batches if necessary). 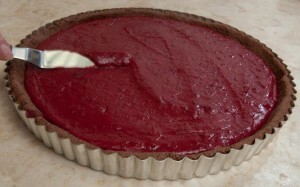 Add the yolks and lemon juice to the processor and process briefly. 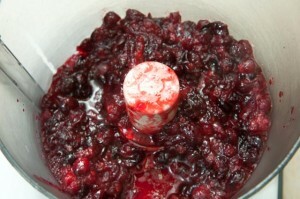 Place cranberry mixture in the top of a double boiler and add the butter. 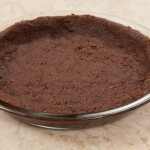 Bring the water underneath to a boil and stir constantly until a thermometer reads 172 degrees. 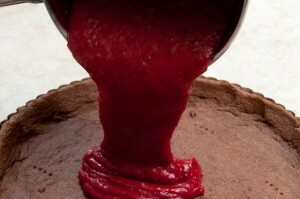 Pour into the baked shell. 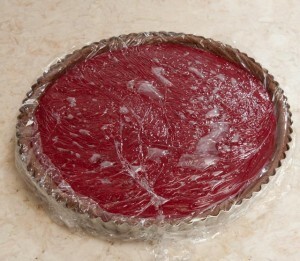 Remove the film from on top of the cranberry curd. 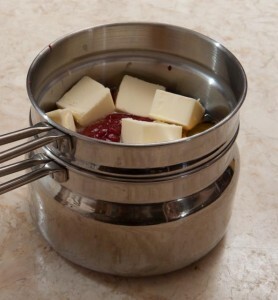 Pour the glaze in the center and move it out to the edge of the curd with an offset spatula. 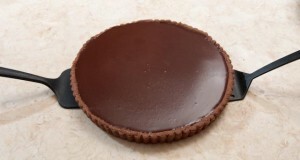 It often works to simply pick the pan up and rotate it around to move the chocolate to the edge. 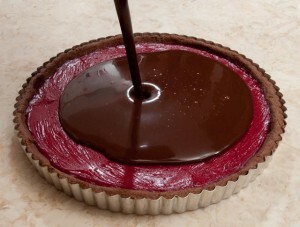 Do not let it get on the crust, just seal the curd in. 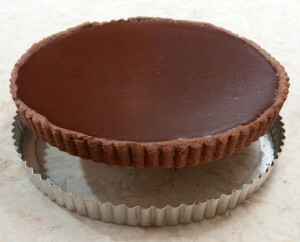 Remove the side of the tart pan by placing the pan on a can and allowing the side to drop. 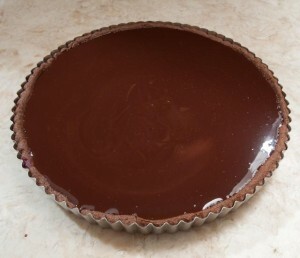 Place a flat spatula between the bottom of the pan and the tart shell. Rotate it around the bottom to make sure the shell is free. 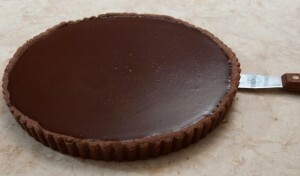 To release from the bottom shell, place two pancake turners on either side of the tart and lift it onto the serving dish. 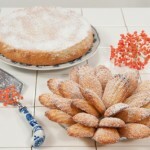 Refrigerate if using within a day or two. Freeze for longer storage. If frozen, thaw in the refrigerator. 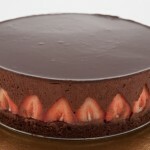 Serve at cool room temperature. 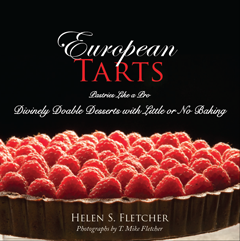 This entry was posted in Front Page and tagged chocolate, cranberries, Dessert, pastry, tart on July 2, 2012 by hfletcher.